About ten years ago, all my brothers and sisters with their kids in tow converged at Mom and Dad's place for a family celebration. There wasn't enough room in the inn for all of us, so Mom rented a cabin at nearby Madge Lake from a family that wasn't using it at the time. Most of us stayed in the main building, a quaint old-school cabin with just enough amenities to make our summer sojourn comfortable. A few people stayed out back in a one room outbuilding. I don't remember much about those August days, except two things. The first was the unpleasant reality that a flu bug passed from kid to kid and then from parent to parent, a 24-hour dandy that was none too pleasant. The second memory is of the wonderful selection of books the property owners had in the small cabin in the back. 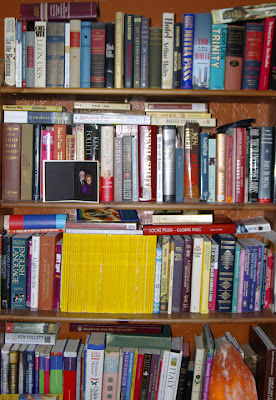 The walls were lined with book shelves, filled with musty old novels. That old book smell was pervasive, as the building was not well insulated and would have let in an abundance of moisture over the years. I loved it and a full decade along I can recall the sensation of being in that space, surrounded by titles, both familiar and foreign, and the smell of dusty paperbacks. Nothing pleases me more - especially during the holidays for some inexplicable reason - than meandering through the aisles at Coles in the Peter Pond Mall. I smile and salivate when I see the latest blockbuster hardcover marked down to $25 after the Christmas rush. I love seeing the hot new titles from favourite authors. I don't necessarily buy something every time out, but almost. 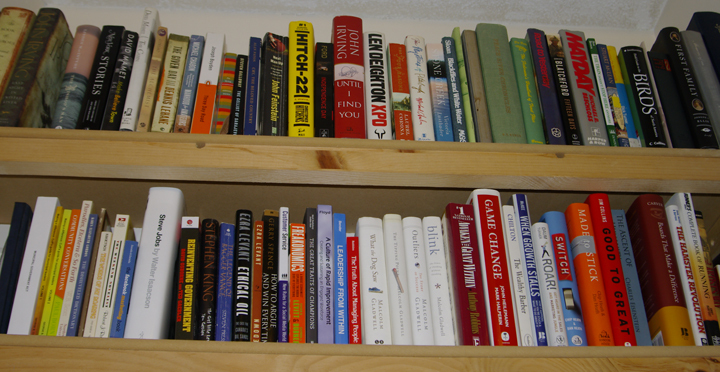 We have a variety of bookshelves in our house, with a hodge podge located in the living room, a selection of business and leadership books above my head in my man cave (see the top of this post), and a flurry of titles and genres in the guest room in the basement. It brings me great joy and comfort knowing that the collected works of Malcolm Gladwell are within arm's reach, that Christopher Hitchens' Catch-22 is in my sights, and that the new Steve Jobs biography by Walter Isaacson is waiting patiently in the reading on-deck circle. There is both permanency and possibility with the current physical form of the written word. Outside of a house fire or apocalyptic annihilation, books are with us for the long haul, if we choose to keep them around. I'm anxiously awaiting my Amazon order of several titles that were featured in this blog a few weeks ago, suggested by friends on Facebook. Anticipation is never sweeter than when waiting for that cardboard box to arrive in the mail full of some new treasures. One of my greatest weaknesses is my proclivity of having multiple books on the go at any given time. 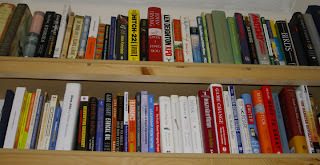 I recently finished the debut novel from the incredible Ayn Rand - We the Living, while working through Good to Great by Jim Collins, In Search of Balance by Richard Swenson, Local Push Global Pull by Joyce Hunt, and Jean Auel's The Clan of the Cave Bear. Don't get me wrong, I love reading digital books on my iPad, too. I particularly like the larger font that medium provides. But at the end of the day I know that those bits and bites of data can disappear just as easily as they conveniently came into my world through the air at my command. So, I vote we keep books around, at least a while longer.